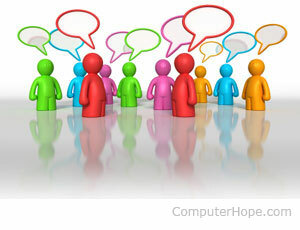 Computer Hope chat is another free service being provided by Computer Hope that allows anyone to connect and ask their questions live and talk with other users who're interested in computers. Our chat was created after many users requested such a service and to help users get their questions answered more quickly. Because of the wide variety of users who help in the Computer Hope chat, we ask all users to obey the rules below. Users who do not follow these rules may be banned from this service and other Computer Hope services. No advertising other websites, services, or companies unless that advertisement answers someone's question. No links, advertisements, or comments about any adult or illegal material. No posting of inappropriate or adult content. Finally, everything said in public chat is logged. Any additional legal information and rules on Computer Hope can also be found on our legal statement. Although Computer Hope operators and volunteers may be logged in, at this time we cannot always guarantee responses at all times of the day. If agents are available to help, you will see an image displaying text indicating agents are available. If you're unable to get a hold of someone, try the other suggestions in our online computer help. If you've been banned from the Computer Hope chat room for disobeying rules or misbehaving, that ban will not be removed. However, if the ban was a mistake, when reviewed in the log, it will be removed. If you want to hasten the speed of the ban removal, contact our webmasters. Who is computerhope and hopebot? Computerhope, aka Nathan, is a human and owner of the channel. Although he may be logged in, he's unable to attend to chat at all times. Additional information about hopebot is on our hopebot definition. Why wont the volunteers help me? All the volunteers in the chat and on the forums are volunteering their time to help others on the Internet. Because they are volunteers, they have a right to choose what questions they want to answer. If a volunteer chooses not to help you with your question, you may choose to contact Computer Hope directly, which may not be as fast, but we do try answering all questions. Computer test questions or homework help are both good examples of questions most volunteers do not enjoy answering. If you have any other questions or complaints regarding the IRC server or the Computer Hope chat, e-mail the webmasters. See our chat definition for further information and related links on this term.